Analysis of social-ecological systems is becoming increasingly used since the framework provides a valuable set of variables for understanding relationships between people and ecosystems. This interaction focuses on the use and management of natural resources that, in many cases, are common-pool resources. In Mexico, common-pool resources have long been explored since at least 60% of the forested lands in the country are held under the legal figure of ‘ejidos’ and indigenous communities, which aimed at driving the collective use of lands and resources. However, few studies incorporate ecological processes for an integrated understanding of social-ecological systems. In this study, we seek to understand how ecological variability influences the creation and functioning of different rules and, consequently, institutions for forests management. Our case study was conducted in an ejido with high ecological variability located in Jalisco on the Pacific coast of Mexico. The research approach was interdisciplinary and combined qualitative and quantitative methods. We conducted participant observation and 23 semi-structured interviews; botanical collections were also carried out. We found that there is strong influence between ecological variables and the emergence of rules and collective action. The most important variables influencing these processes were the economic value of resource units, ecosystem services perceived by local people and location and size of the resource system (including area and number of species). Historical processes also play a part that generates knowledge of resource systems and the current social, economic and political settings at a larger scale. The establishment of relationships with variables that produce certain outcomes for the framework of the social-ecological system is an important challenge to be met in order to move forward in both theory and practice. Ecosystems are essential for humans since their subsistence depends upon the existence and maintenance of natural ecosystems and the goods and services they provide. Nevertheless, it is recognized that every landscape and natural habitat has been highly influenced by human actions (Chapin et al. 2009). The consensus view for understanding the environment is through the concept of the social-ecological system (SES) (Berkes and Folke 1998; Liu et al. 2007; Ostrom 2009; Collins et al. 2011) and there is therefore a requirement for integrated views that allow us to interpret how social and ecological systems link together. Some frameworks have been constructed in order to understand these interactions, however, not all of these treat the social and ecological dimensions with equal importance (Binder et al. 2013). The SES framework with a nested composition is considered to be an important interdisciplinary tool for understanding social and ecological interactions (Ostrom 2009; McGinnis and Ostrom 2014). Many studies with the SES framework have shown the importance of institutional infrastructure in contending sustainable resource management (Janssen and Ostrom 2006; Janssen et al. 2007), but few have incorporated ecological information in order to explain both social and ecological outcomes (Epstein et al. 2013). The ecological conditions of a given territory generate different values and perceptions (Gerritsen 2010; Flores-Díaz et al. 2014) and become important components in decision-making processes and consequently in the emergence of rules and institutions for ecosystem management (Dustin Becker 1999). Ecosystem variability in the rule-making process can be especially important in megadiverse countries such as Mexico (Sarukhan et al. 2014) and where great ecosystem heterogeneity can be found in small areas. Likewise, local institutions and management strategies use the landscape mosaic in a dynamic way by adapting their management practices to this diversity in order to obtain benefits (García-Frapolli et al. 2008). The aim of this paper was to incorporate and analyse ecological characteristics to explain a case study in the Mexican agrarian context of an ejido. Our case study is located in the Pacific coast of Mexico where many resource systems converge, producing very heterogeneous ecological conditions that allow us to observe the response to this heterogeneity in social processes. Our main questions were how ecological variability can influence the creation and functioning of differential rules and, consequently, the emergence of forest management institutions, and how the SES framework reveals interconnections when incorporating ecological information. The following lines address the important conceptual grounding for this paper: First, the SES framework with the latest changes and their challenges; second, what does variability makes on SESs and its relevance; and third, the Mexican ejido as an institutional platform for the governance of common-pool resources (CPR). We then present our case study according to the SES framework. One of the main features of SESs is the complexity of the interaction between the many variables that produce outcomes. Here is when a framework is “useful providing a common set of potentially relevant variables to use in data collection instruments, the conduct of fieldwork and the analysis of findings, thus helping to provide information for policies” (Ostrom 2009, 420) or indeed for further investigation. The SES framework proposed by Ostrom (2009) in collaboration with other researchers was designed with this aim and it has proved over many studies to be a useful tool for interdisciplinary research. One important challenge is to understand how combinations of social and ecological variables jointly affect outcomes and how different components are related to each other (Agrawal 2001; Epstein et al. 2013; McGinnis and Ostrom 2014). Fortunately, this framework is still under construction, mainly because it constantly receives feedback from many disciplines. A recently recognized issue of significance has been the poor level of inclusion of ecological information when examining SESs, which is also found in the CPR literature (Agrawal 2001; Epstein et al. 2013). Studies in these topics have been paying more attention to the institutional aspect, partly because of the origin of the framework in the Institutional Analysis and Development (IAD) framework (Ostrom 2005; Clement 2010; Ostrom 2011a; Epstein et al. 2013; McGinnis and Ostrom 2014). Although the SES framework did consider the subsystems of resource units (RU) and resource systems (RS) (Ostrom 2009), there are few studies that incorporate their variables or they are considered of secondary importance in the understanding of SESs (Janssen et al. 2007; Blanco 2010; Fleischman et al. 2010; Cinner et al. 2012; Duer-Balkind et al. 2013). In recent years Epstein and colleagues (2013) remark that there are some physical, chemical and biological conditions that are set in ecosystems as ‘rules’ and cannot be overlooked when trying to explain interactions and outcomes in SESs, leading to the inclusion of a new core subsystem in the SES framework, the “ecological rules” (ER; see Figure 1). Their decision to name biophysical conditions as ‘rules’ is based on their idea that “human beings and non-human resources can both be understood in a general sense as agents whose actions (or properties) are governed by rules” (Epstein et al. 2013, 441). One may differ with the use of the term ‘rule’ as used by these authors since rulemaking by humans is a conscious and intentional process (Renfrew 2009), part of the origin and evolution of culture (Boyd and Richerson 2005). Ecological phenomena, on the other hand, occur since the origin of life on Earth mainly through evolutionary biological processes (Holling 1973). Nevertheless, we agree with the need to include more deeply ecosystems components and functioning in SESs analysis because ecosystems impose ‘limits and accesses’ to what humans can do. Thus the use of ecological rules may facilitate more deductive ecological reasoning that can illuminate important features of the resources and resource systems for case-based studies (Epstein et al. 2013). The social-ecological system (SES) framework with the first-tier components: Resource Systems (RS), Resource Units (RU), Governance Systems (GS) and Actors (A), adding the Ecological Rules (ER) from Epstein et al. (2013), determining conditions for RS and RU and connected to the social world influencing Action Situations (adapted from McGinnis and Ostrom 2014). One way in which to analyze human interactions with their natural world is through the Action Situation concept from the IAD and the SES framework. This concept is the deductive core in the SES framework (Ostrom 2011a; Epstein et al. 2013), which includes the Interaction (I) and Outcomes (O). According to Ostrom (2011a, 11), “action situations are the social spaces where individuals interact, exchange goods and services, solve problems, dominate one another, or fight…” Any action situation is partially dependent on rules, and these rules can be changed by the interacting participants (McGinnis 2011). Multiple rules and norms define what actions are permitted, prohibited or required (Ostrom 2011a); these rules can also be found at different levels: operational rules (day-to-day), collective-choice rules, and constitutional rules (Ostrom 2011b). Operational rules include management of the resources and their systems that are in many cases CPR, crafted at the collective-choice level. 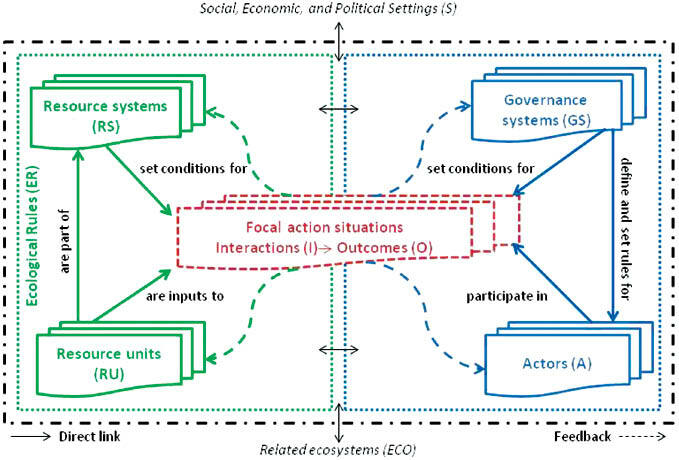 Adding ecological variables to the understanding of action situations can make more predictable outcomes and their networked structure (McGinnis 2011), as well as the interconnections between the social and natural subsystems. Environmental variability can be expressed in terms of time, space or stochasticity and this variability can play a critical role in SES dynamics (Ludwig et al. 1993; Duer-Balkind et al. 2013). These systems face predictable and well-understood variation as well as unpredictable temporal and spatial variation in social and natural components. Seemingly similar ecosystems can respond differently to identical changes in a system, depending on the history and spatial location within the landscape (Kratz et al. 2003). This can also be applied to SESs where the environmental history, culture and other social processes can help people to adapt to different changes. Robust SESs can maintain flows of desired ecosystem goods and services within some tolerable bounds (Janssen et al. 2007); to sustain these flows, there is a requirement for institutional flexibility and adaptability to change. Many case-studies have shown that local and regional SESs, with particular groups of people, resources and sets of institutions that operate together, have existed for more than centuries by adapting their institutions to local natural variability (Berkes and Folke 1998; Janssen et al. 2007). This variability can also increase the resilience of the system (Duer-Balkind et al. 2013). It has been found that heterogeneity in vegetation and landscapes are both related to complex interactions of geophysical templates and anthropogenic effects (Kratz et al. 2003) and the evidence shows that biogeophysical context strongly conditions human decisions (Redman et al. 2004). In the SES framework, resource systems are ‘exogenous forces’ or ‘drivers of changing circumstances’ for the actors (McGinnis and Ostrom 2014), and how these forces affect the actors is a main question. It is known that characteristics of resource systems and units affect interests in collective action for their management (Poteete et al. 2012). It is difficult to know when and what ecological conditions affect actors and governance processes because all the variables are entangled. However, it is possible to obtain an approximation with different ecological conditions or ecosystem heterogeneity within the same SES and observing the response in the social phenomena. In order to identify the specific rules or agreements for a particular resource system, it is important to observe the networked and dynamic structure of action situations (McGinnis 2011; Epstein et al. 2013). Mexico represents a unique case of common property within Latin America. From the early 20th century, large areas of forest were assigned to local communities under different levels of control (Bray and Merino 2004). Although a precise percentage is still unknown, 60% of the country's forested area is the lowest figure recognized of lands belonging to indigenous or ejido communities (Skutsch et al. 2013, 2015). These both types of agrarian organizations emerged from the Mexican Revolution (1910–1917) and they perform a key role in the condition of Mexican forest ecosystems. At present, the ejidos and indigenous communities combine communal and private property rights (Schroeder and Castillo 2012). The subdivided plots of land (in many cases, the most productive lands for cattle or crops) are under a private property regime and the common lands (where most of the forests are located) are under a legal common property regime. In ejidos (the focus of this study), decision and rule-making processes related to the use and management of common lands are performed by the Assembly (the main authority formed by all members of an ejido) and the Ejido Board, which is a committee formed by a president, a secretary and a treasurer. There is also the Supervisory Board, responsible for ensuring compliance with agreements by the Assembly. All of these posts are elected by the Assembly. This situation makes the ejido an excellent institution in which to explore the management of CPR and to examine the effects of the common property regime. Ejidos are also recognized as “shells” that protect social-ecological systems (Alcorn and Toledo 1998; Schroeder and Castillo 2012), facilitating institutional mechanisms for controlling user access and exclusion as well as rights over the resources (McKean 2000). The study of CPR and forest management in Mexico has long focused on cases of forestry use and mainly in temperate forests (Merino 2004). This has created a gap in the understanding of other ecosystems and uses. Exploring what do other ecological conditions trigger in social processes is important to feed the theory of CPR. Many successful (and unsuccessful) cases in Mexico, with a diverse assembly of ecological conditions, actors and institutions, offer a starting point from which to observe and analyse these interactions. The ejido Pabelo is located in the upper part of the basins of the Cuitzmala and San Nicolás rivers, in the municipality of Villa Purificación, Jalisco (Figure 2). Its main town is named after the ejido and has 476 inhabitants; there are also 16 smaller villages adding 597 inhabitants. The area of the ejido is 14,347 ha; of which 6300 ha constitute the common lands forming the largest continuum of forests. There are 164 ejidatarios with holding rights over these forests. The rest are the individual plots of the ejidatarios and posesionarios and a few urban areas. The altitude ranges from 600 to 2400 m, allowing the existence of a highly diverse environment. Main vegetation types include tropical sub-deciduous forest, cloud forest, oak forest, pine-oak forest and riparian forest. There are induced grasslands in nearly 90% of the plotted area, while around 10% is cultivated with avocado, maize, sugar cane, banana or lemon, among other crops. The main activity in the ejido is cattle production, although forestry has been also practiced. Since 2012, the ejido has incorporated around 1500 ha into the Mexican government Payment for Environmental Services (PES) program. Location of the ejido Pabelo and the San Nicolás and Cuitzmala rivers and basins in Jalisco state, Mexico. The nature of our research problem is clearly interdisciplinary and therefore had to be resolved using more than one single method (Newing 2011). Access to the community was obtained through a formal written petition and by explaining our objectives to the local authorities. The main research methods employed included participant observation, semi-structured interviews and collection of botanical specimens for identifying the vegetation units and useful species. The approach for acquiring and analysis of the social data was based on grounded theory, in which the research is guided by broad questions or topics so that results are not influence by the researcher's own perceptions (Strauss 1995). The main topics included in the interviews were: history of land distribution (property-rights systems) and forest use; identification of stakeholders and other actors, decision-making processes and collective action, the rules constructed for the use and management of different forest types, the local knowledge regarding these forests types and their dynamics and resource units. A total of 23 semi-structured interviews were conducted. 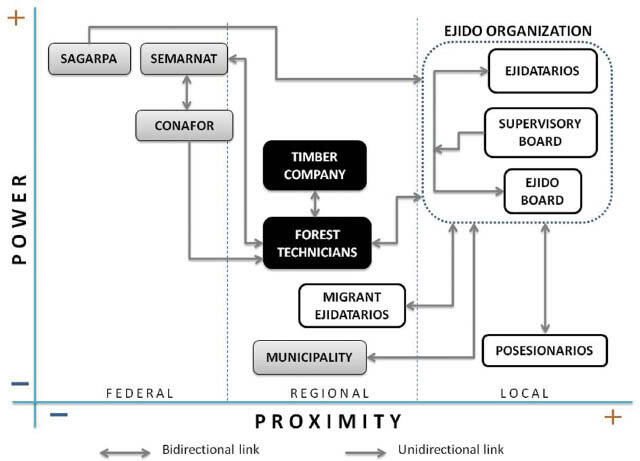 The informants were divided into 2 groups: direct users (10 members or ex-members of the Ejido Board and 9 ejidatarios - the people who legally own plots and have rights on the common lands) and indirect actors, who could influence the decisions of direct users (2 foresters, 1 municipal council and 1 regional historian). All interviews were recorded and then transcribed literally for the analysis. We used the software Atlas.ti, which allows analysis of qualitative data in a more systematic and structured way. This was achieved by creating codes for ideas or quotations and assigning frequencies and constructing relationships among them. This is the base (the grounding) for building an explanation (Strauss 1995). To characterize the vegetation units where forest management is conducted, we documented field observations describing the vegetation community and collected representative plant species. We also identified management actions (i.e. logging, firebreaks and reforestation). From interviews and observations, we created a list of useful plants in the ejido that, along with the botanical specimens, were then confirmed by the interviewees. Information regarding the type of use (medicinal, edible, wood, forage, fencing and others) of these plants was recorded. For plants that could not be collected, we used other ethnobotanical and botanical studies of the region (Vázquez et al. 1995; Sánchez-Matías 2004; Morales and Rodriguez 2012). The next section presents the results as follows: first, a brief history of the ejido and its lands; second, a description of the relationships within the social system, including those of the actors and their governance system; third, we establish some relationships in the natural system, including resource systems presented as vegetation units of forest types and resource units recognized as the useful plant species. Finally, the conjugation of both systems is presented in the section of action situations on Table 1. Summarized information about the different section situations identifying every resource system and their resource units along with the governance system and actors. * For scientific names see the Appendix. The ejido was founded in 1938 with 164 ejidatarios. Land distribution was not equal because, at the beginning, “one received what one could manage to work” and also the ‘quality’ of land differed. From 1940 over the following decades, the south coast of Jalisco underwent an economic boost promoted by the regional government (Regalado 2009). At that time, large areas of mainly tropical forest were drastically transformed into agricultural land (Castillo et al. 2005). With the 1992 changes to the Mexican Constitution and the execution of the program PROCEDE (Program for Certification of Ejido Rights and Titling of Urban Plots), ejidatarios realized that the common lands of the ejido could not be divided into plots (contrary to past internal arrangements). At present, the status of property rights is ambiguous in the common lands of the ejido and conflicts have arisen among members as a result, even though the monetary profits from forestry and benefits from PES are equally distributed among all ejidatarios. Cattle production is the most important economic activity; plots are covered with forage grasses and also this activity is carried out in almost all forests in the ejido feeding on the natural vegetation, except the most inaccessible and steep zones. The network of actors in Pabelo is shown in Figure 3. On the one hand, there are direct users; these are the ejidatarios and posesionarios. This last actor differs from the ejidatario because they only own plots but do not have any rights on the common lands or participate in the Assembly. As a result of the high levels of migration in the area, the ejidatarios were divided between those who live in Pabelo and manage their plots (70%) and those who live abroad (30%), mainly in the United States of America, and who rent their lands and delegate their vote at the Assembly to someone else. Map of actors reflecting their power to make decisions and action in terms of ejido forest issues and proximity to the resource. Direct actors are represented in white boxes, governmental institutions in grey and the private sector is represented in black. The link between actors can be bidirectional or unidirectional. On the other hand, there are federal governmental institutions that use public policies to influence the direct users regarding natural resource management decisions. These institutions include the National Forestry Commission (CONAFOR), which is in charge of promoting and approving programs such as PES; the Secretary of the Environment and Natural Resources (SEMARNAT), which approves logging management plans. The Secretary of Agriculture, Livestock, Rural Development, Fisheries and Food (SAGARPA), promotes livestock production and agriculture with programs subsiding in cash per cow and per hectare with grass planted every year. The ejidatarios recognized that these programs have significantly affected the forests, especially in the past since, in order to include more hectares in the program, the people have to cut trees to plant forage grasses and have more cattle. Regional institutions at the municipality level do not have many responsibilities or capabilities in issues of forestry; however, they assist the aforementioned institutions with some activities such as the formation of fire brigades. At the regional scale, the role of the forest technicians is crucial. They act as links between governmental bodies, timber companies, and ejidatarios. The relationships among these actors are represented in Figure 3. Forests represent around 52% of the ejido area. Some of these forests are in the continuum of the common lands, with over 6300 ha while the rest are in fragments located in the plots, adding approximately 1206 ha. Figure 4 presents a diagram of the different vegetation units and transformed areas present in Pabelo. Diagram presenting ecological variability in the ejido Pabelo, including the different vegetation units and transformed areas. Tropical sub-deciduous forest and cloud forest. Ejidatarios assigned the same name (‘verdura’) to these two forest types, with reference to their evergreen foliage. However, local people recognize differences in the species composition. Fir trees (Abies guatemalensis var. jaliscana) are found only at high elevations in the cloud forest. Other tree species, such as ‘mojote’ (Brosimum alicastrum), are present at low elevations in tropical sub-deciduous forest. It is important to note that cloud forest is one of the least represented and most endangered forests in the Mexican territory, yet it contains the highest floristic richness per unit area, as well as high levels of endemism and many endangered species (Villaseñor and Ortiz 2014). In Pabelo, this forest type covers around 30% of the common lands but can also be found as patches in the plots because, according to interviewees, it provides services such as shade, fodder, soil fertility and wood. In the past decade, there has been logging activity in this forest, but now some of the species are under protection by Mexican law. These species include walnut (Juglans major), cedar (Cedrela odorata) and the firs. Cattle also forage in this forest for the natural vegetation but only in a few areas because the terrain is very steep. In 2012 the PES program was approved in an area of 1500 ha, chosen by the Ejido Board and forest technicians. This decision was taken according to the CONAFOR eligible areas of cloud forest distribution. These areas did not have many other uses and therefore the project had general acceptance among the ejidatarios. The idea to implement the project came from the forest technicians that were aware of the PES programs. Some interviewees did not know about the program and what activities were required to undertake. Those who did know mentioned that the program serves to preserve plants and animals. Management actions include firebreaks, monitoring, area delimitation and installing signposts. Every year, staff from CONAFOR verifies the actions that are performed. The perception of the people is that these forests possess exceptional beauty and much diversity of plants and animals and as a place of recreation and possibly for tourism. A total of 48 useful plant species are known from these forests, 40 of which are trees. Oak forest. This vegetation type is dominated by trees of the genus Quercus and is well represented in both the common lands and individual plots. Many of these forests are near population centers where the terrain is suitable for cattle ranching. Oaks are one of the most commonly used plant species in the ejido. People recognize over 10 different species of oaks and the most important uses are for fencing and firewood. These uses are similar to those in many other regions in Mexico (Challenger 1998). The only rule for extraction is that the use of the timber has to be personal or domestic. Despite the local importance of these forests, many have been subjected to severe land use change and present different stages of degradation. Many ejidatarios plant pasture for their cattle, thus inhibiting the germination of oaks. These forests are seen as stock for wood, but people do not seem to perceive any commercial value in them. People described facing the dilemma of either transforming these forests into more productive land in order to obtain economic benefits or simply conserving them as they are. A total of 14 useful plant species were recognized in this forest type. Oaks were mentioned in all interviews. Pine-oak forest. In the ejido, this forest is found on a mountain located in the upper part of the Cuitzmala River, on the common lands. This is the only forest type with a legal program for timber extraction. The logged trees are pines; two main species are Pinus jaliscana and Pinus oocarpa. The former is endemic to some Pacific humid sierras of Jalisco (Farjon et al. 1997), and excellent for timber extraction because it has long shafts. People mentioned the strong impact of logging roads on these forests in terms of promoting soil erosion. Moreover, fires are common and difficult to control. In order to promote the conservation of this forest, fire brigades have been enforced, as well as activities of monitoring and prevention. Forest harvesting has been carried out for more than 30 years. Permits last 10 years and the last one terminated in 2012 and has not yet been renewed. This activity was firstly promoted by one president of the Ejido Board who displayed strong leadership in developing this initiative. With this activity, conflicts over property rights arose between some ejidatarios that claimed more economic benefits. Their argument is that they have assigned the right to use these areas for their cattle and forest extraction affects this activity, also they perceive these areas as theirs. The timber is sold to a company responsible for all of the activities of extraction, transportation and restoration. This company hired people from the ejido (sometimes the same people from the Ejido Board or, at least, chosen by them) to perform these duties and also paid forest technicians to conduct the technical studies. The ejido Supervisory Board was in charge of monitoring the marking and cutting of trees. The relationship between cost and benefit with the timber extraction does not provide many benefits to the ejidatarios and the environmental costs are high. At the time, the ejido functioned as a forest ‘renter’, despite the fact that some ejidatarios recognized that forestry and wood processing could be a source of employment and income if they did not sell round wood. There was an initiative 20 years ago supported by a trust fund to install a sawmill. Although the machines were bought, local people never got to start it because they never agreed in the Assembly how to distribute its possible benefits. There is a perception that pines are fast growing species and regeneration following timber extraction is easy if the land is well cared for. A total of 17 useful plant species were recognized in this forest type, of which 11 are used for timber and wood. Riparian forest. This is the typical forest on the banks of rivers and streams and it plays a vital role in the maintenance of multiple ecosystem functions (Méndez-Toribio et al. 2014). Two important Pacific rivers, the Cuitzmala and the San Nicolás, have their sources in Pabelo. Riparian forest vegetation is often mixed with the surrounding forests, but some species are especially adapted to floods and sediment abrasion (Naiman and Décamps 1997). In the common lands of Pabelo, this vegetation is excluded from any exploitation; however, there was some logging activity more than 20 years ago. Today, local institutions promote the conservation of these forests, which is reinforced by federal laws. In the plots, the majority of owners reported conserving these forests because of the services they provide, especially water provision for cattle and the maintenance of water flows. Recreation and fishing are major activities in these locations. The main resources are prawns (Macrobranchium spp. ), for which there is a close season. In addition, important plant species such as ‘mojote’ (Brosimum alicastrum), ‘guamara’ (Inga laurina), ‘juaquiniquile’ (Inga eriocarpa) and ‘marota’ (Smilax domingensis) are very abundant. These species have many uses, and can be edible, fodder or medicinal. A total of 24 useful plant species were recognized, 12 as edible plants and the rest mainly for medicinal and fodder purposes (see Table 1 and Appendix). Many management actions take place in the forests of the ejido of Pabelo and the outcomes vary in their sustainability performance. The level of collective action and rules we observe on different resource systems are the result also of the interaction of particular variables. Table 1 summarizes the information regarding relevant variables for the social and ecological subsystems and the interactions and outcomes for each resource system. 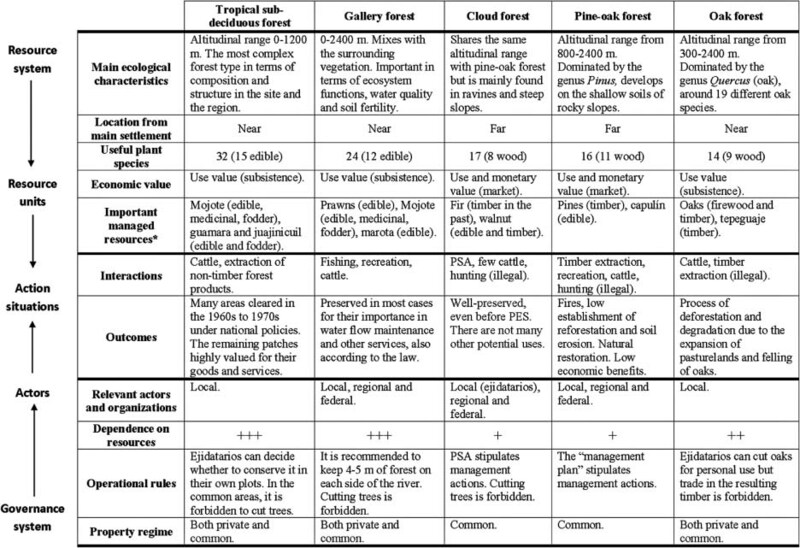 This table emphasizes the reach of the ecological conditions on forest management and rules. Users and actors related to CPR in the case of Pabelo present differential responses to decisions and rule-making processes associated with the ecological variability. More collective action is shown in some forest types than in others, although they have the same social capital. Ecological characteristics or ‘rules’ include biological, chemical or physical aspects (Epstein et al. 2013). In our case study the biological conditions are related to which species are naturally found in the forests and the composition of the forest community. More diverse communities, which are not dominated by one species (cloud forest and tropical sub-deciduous forest), are more likely to be used for subsistence and for edible and medicinal purposes. Where the dominance of some woody species is present (oak and pine-oak forests) forest extraction for personal or commercial purposes are developed. On the physical conditions the topography (i.e. hilly, slope, flat or flooded) determine suitable areas for specific human activities and also low or high opportunity costs. The maintenance of biogeochemical processes such as soil fertility, water flow and quality are also related to specific ecological conditions of forests, especially in the case of gallery forests. As a result, conservation and non-extractive uses of these forests are developed. Some of the primordial variables from resource systems and units that are affected by these ecological conditions include the economic value and ecosystem services associated with non-consumptive values recognized by users and actors. We also found that the location and size of resource systems are very important in processes of conservation or degradation. Below, we emphasize some of these links found in the different forest types present in this case study (see Table 1). In the pine-oak forest, the economic value of species of the genus Pinus moved people in the Assembly to promote performing a technical study and to look for a company to sell their timber. They also organized a fire brigade and later tried to install a sawmill and a workshop for woodwork. The economic value of resource units can exert an effect on decision and rule-making processes; evaluating the relative costs of the management strategy. As feedbacks, we have the regulations concerning these resources from the operational to the collective choice level crafted at the Assembly, which are de facto rules. It should be considered that some effects may be negative where property rights are not well defined (Poteete et al. 2012) as was shown in this case. When communities present conflicts, the effects can be observed directly in the condition of forests, e.g. the incidence of wildfires (Merino and Martínez 2013). Another important characteristic in this forest type that drives decisions is the knowledge of the resource system by users. For example, it is recognized that regeneration (growth rate) is faster than in other forests and there is knowledge regarding the conditions under which it is best carried out (time and space). Similarly, the decision not to renew the logging license in the future is a consequence of the reduced diameters presented by the pines (expressed by the forest technicians) and acknowledgment of other conditions of ecosystem degradation, as well as the low economic benefits. This shared ‘ecological knowledge’ is recognized to be a very important characteristic in successful resource management by user groups (Alcorn and Toledo 1998). Furthermore, not every forest type is considered suitable for forest harvesting and becoming profitable; there is a relationship between economic value and the dominance of certain species (i.e. of Pinus) in ecosystems. This biological rule determines that this forest type is suitable for this activity, coinciding thus with most of the successful cases of forest management that have occurred in the pine forests of Mexico (Merino and Martínez 2013). Many local conservation processes are the result of awareness of ecosystem services; identifying their delivery and benefits for people (Porter-Bolland et al. 2012). In the riparian forest, delivery of the important service of water provision at a local and regional level is delivered by the integrity of the forest. While the decision to keep this forest type in the plots is the choice of the ejidatarios or posesionarios, on the whole, this forest is a CPR because is dependent upon the conservation practiced by people upstream. Here the local knowledge about how this process develops is important on many of the operational rules for their management. This forest may fail to produce many of the products and benefits obtained if it is divided, and we can say that together it represents an indivisible resource (McKean 2000). This biophysical condition promotes rules and arrangements at local and regional levels, considering the implication for the whole watershed. Going beyond our study site, the watershed vision has created institutions at the regional level including actors from ejidos and communities, the local municipalities, government and academia (Schroeder and Castillo 2012; Flores-Díaz et al. 2014). Due to the great importance of water and its scarcity in the lower parts of the watershed, regulating the impacts of management on riparian forest has become an extremely relevant issue (Maass et al. 2005; Riensche et al. 2015). In the watershed, the management of this forest has discrepancies presented in practice. Despite they are highly value by local people some productive activities, however, threaten the maintenance of these forests and the quality of water (Flores-Díaz et al. 2014). In the oak forest, it is probable that the lack of arrangements for sustainable use is a consequence of its abundance, in both species and area (size of resource system). This forest type is one of the most well-represented in Mexico and the region (Rzedowski and McVaugh 1966). It also has a contradictory double function (provides oaks and be pasture lands), which jointly generates its degradation. Scarcity of this resource may take long periods of time and may influence people's ability to perceive degradation until it is too late. People recognize the absence of sustainable use options for this forest, as with other cases in Mexico, and this absence has consequences for its conservation at the local and the national level (Merino and Martínez 2013). It is evident that oak forest has higher opportunity costs in the ejido than, for example, cloud forest. Nevertheless, the operational rule in the ejido to use the species of this forest for personal use only and not for trade is important for its long-term maintenance. 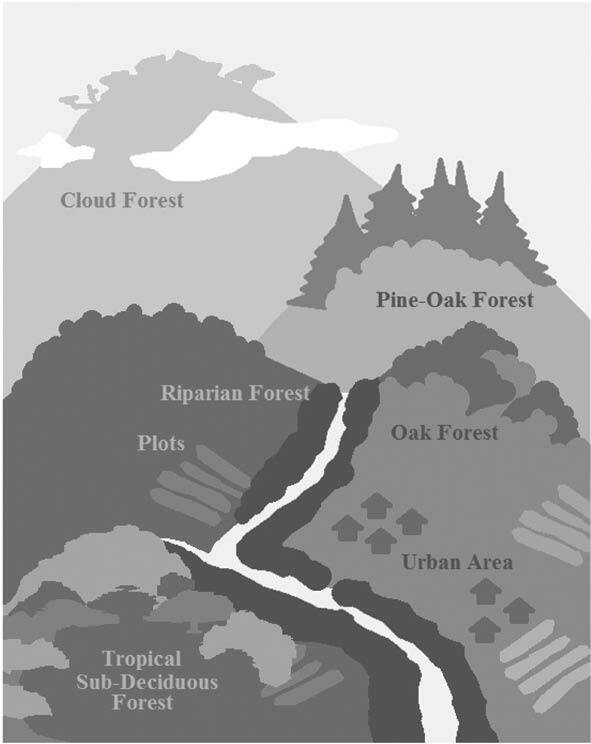 The conservation status of cloud forest in the ejido is closely related to location; many of these forests are located far from population centers and have a hilly topography in common with other conserved forests in the region (Castillo et al. 2005). Some management actions such as the PES, created with a top-down logic, do not consider the local mechanisms that are already acting to preserve these forests. The PES program was created with opportunity cost; in Pabelo, and in many other cases, this opportunity cost is not really present and some areas have de facto protection because of the lack of other options of use. This additional principle has been pointed out in other cases related to PES (Skutsch et al. 2015). However, the program seems to improve collective action and reinforce social capital by allocating some of the money to fund activities of prevention and maintenance carried out by the ejidatarios. Tropical sub-deciduous forest as being one of the most diverse and complex forests on the region (Rzedowski and McVaugh 1966), are now highly valued for many of their resources and uses. Also they are scarce in Pabelo and the region because national policies during the second half of the 20th century promoted the expansion of agriculture through transformation of these forests (Merino 1997). Despite the importance we are trying to demonstrate of certain aspects of ecosystems in the decision and rule-making processes, we cannot disregard the fact that other economic, political and cultural phenomena at a larger scale also influence forest management and conservation (Gerritsen 2010). This situation can be clearly observed when local institutions are of insufficient strength to deal with external pressures. Demographic factors, such as migration as a result of lack of local opportunities, break the ties between migrants and their communities and reduce collective action (Meyerson et al. 2007; Schroeder and Castillo 2012). This degradation of the social capital has consequences for every forest type. These consequences in our case study are mostly negative because the holding rights owners are not present to make the most adequate decisions over the forests. Moreover, markets and cash-income activities can change SESs and disrupt the balance of a system that combines the management of several land-use units to produce both subsistence and market commodities (García-Frapolli et al. 2008). If cash-income activities are promoted and incentivized by governments, these activities can produce critical changes in the SESs. In this case, cattle production puts the maintenance of some forests at risk. When considering ecosystem services as a part of the resource system, we find that this characteristic has either been overlooked in the SES framework or has been difficult to incorporate because often an ecosystem service is not a discrete unit or product (McGinnis and Ostrom 2014). The most closely related attribute can be ‘productivity of system’ but it does not really fit with the ecosystem service concept. The focus on physical resources and extraction activities from the CPR theory has left strict conservation activities less understood in SES framework (Bray et al. 2012). One important step to understanding the management of CPR and their institutions is to identify which ecosystem services are perceived and used by local people (Castillo et al. 2005). Recognition of these ecosystems services at different scales also enhance multi-level governance of resources (Bray et al. 2012) and the explicit inclusion of these services in the SES framework as a category of the resource system is important. The management strategy performed in Pabelo combines different land uses and activities adapted to the ecological variability of the location. This multiple-use strategy reduces risks associated to external socio-economic and ecological disturbances and also gives the community partial control over its own food security (Barrera-Bassols and Toledo 2005; García-Frapolli et al. 2008). While livestock production is the main activity; others such as agriculture, forestry, fisheries, hunting and PES are incorporated into the economy and livelihoods of the ejido inhabitants. It should be acknowledged, however, that livestock production is practiced by keeping different types of forests, generating a diversity of agroforestry systems. This type of diversified strategy promotes SES resilience as well as the biodiversity associated with it (García-Frapolli et al. 2008). Rule-based reasoning as the basis of social institutions, in the form of regulations, norms and shared strategies (Ostrom 2011b), can be strongly influenced by the characteristics of the resource system, as shown in this case study. This paper highlights the key role of ecological variability in rule-making processes and consequently in the design of institutions for ecosystem management in SESs. A future challenge would be to identify more precisely which ecological variables (e.g. ecosystems, ecological communities, species abundance, species dominance, diversity, domestication, etc.) influence social processes and change and how these are maintained and adapted over the years. This can be the matching point of two important features of the SES: the resilience and the Institutional Analysis. The ‘bounty’ of ecosystems and their biodiversity is in many cases the product of long periods of coexistence that generates knowledge in an empirical form. These long periods of time can produce adaptation to ecological variability and lead to the development of specialized institutions (Janssen et al. 2007). The SES framework points out that governance systems influence resource users and these in turn affect resource systems (McGinnis and Ostrom 2014). We consider that influence and change can also emerge from resource systems. Preserving well-functioning small-scale SESs in order to manage ecological resources may be as important for the future as preserving biodiversity. Preserving institutional diversity maintains a set of solutions for social systems that are adapted to a range of ecological contexts (Janssen et al. 2007). The legal recognition of ejidos in Mexico has encouraged institutions and agroecosystems to adapt to natural and social changes (Alcorn and Toledo 1998). It is not easy to elucidate the intricate relationship between users, actors and their resource systems; however, beginning with representations of dynamic linkages in complex contexts, it is important to further our understanding of SESs (McGinnis and Ostrom 2014). This paper constitutes a partial fulfillment of the Graduate Program in Biological Science of the National Autonomous University of Mexico for the first author who also acknowledges the PhD scholarship received from CONACYT, Mexico. Funding was obtained by the “Programa de Apoyo a Proyectos de Investigación e Innovación Tecnológica (PAPIIT UNAM)” through the projects: IN300813 “Manejo de recursos comunes en la costa sur de Jalisco” and IN300514 “Análisis de los medios de vida sostenibles e implicaciones de las estrategias de manejo de recursos naturales de comunidades rurales en México”. We are very grateful to the many people of the Ejido Pabelo who were very open to share their views and valuable information for this study. We also thank to Pablo Carrillo on the botanical identification and Regina González Villarreal for its technical support as well as the English editing of Keith MacMillan. We thank the editor and the two anonymous reviewers for their valuable observations to improve the quality of this paper. Agrawal, A (2001). Common Property Institutions and Sustainable Governance of Resources. World Development 29(10): 1649–1672. http://dx.doi.org/10.1016/S0305-750X(01)00063-8. Alcorn, J. B and Toledo, V. M (1998). Resilient Resource Management in Mexico's Forest Ecosystems: The Contribution of Property Rights In: Linking Social and Ecological Systems: Management Practices and Social Mechanisms for Building Resilience. Berkes, F and Folke, C eds. : 216–249. Cambridge, UK: Cambridge University Press. Barrera-Bassols, N and Toledo, V. M (2005). Ethnoecology of the Yucatec Maya: Symbolism, Knowledge and Management of Natural Resources. Journal of Latin American Geography 4(1): 9–41. http://dx.doi.org/10.1353/lag.2005.0021. Berkes, F and Folke, C (1998). Linking Social and Ecological Systems for Resilience and Sustainability In: Linking Social and Ecological Systems: Management Practices and Social Mechanisms for Building Resilience. Berkes, F and Folke, C eds. : 1–25. Vol. 1Cambridge, UK: Cambridge University Press. Binder, C. R, Hinkel, J, Bots, P. W. G and Pahl-wostl, C (2013). Comparison of Frameworks for Analyzing Social-ecological Systems. Ecology and Society 18(4): 26. http://dx.doi.org/10.5751/ES-05551-180426. Blanco, E (2010). A Social-Ecological Approach to Voluntary Environmental Initiatives: The Case of Nature-Based Tourism. Policy Sciences 44(1): 35–52. http://dx.doi.org/10.1007/s11077-010-9121-3. Boyd, R and Richerson, P. J (2005). The Origin and Evolution of Cultures. New York: Oxford University Press. Bray, D. B and Merino, L (2004). La experiencia de las comunidades forestales en México. México, D.F. : Instituto Nacional de Ecología, Consejo Civil Mexicano para la Silvicultura Sostenible A.C.
Bray, D, Duran, E and Molina-Gonzalez, O. A (2012). Beyond Harvests in the Commons: Multi-Scale Governance and Turbulence in Indigenous/Community Conserved Areas in Oaxaca, Mexico. International Journal of the Commons 6(2): 151–178. http://dx.doi.org/10.18352/ijc.328. Castillo, A, Magaña, A, Pujadas, A, Martínez, L and Godínez, C (2005). Understanding the Interaction of Rural People with Ecosystems: A Case Study in a Tropical Dry Forest of Mexico. Ecosystems 8(6): 630–643. http://dx.doi.org/10.1007/s10021-005-0127-1. Challenger, A (1998). Utilización y conservación de los ecosistemas terrestres de México. Pasado, presente y futuro. México, D.F. : Comisión Nacional para el Conocimiento y Uso de la Biodiversidad. Universidad Nacional Autónoma de México. Chapin, F. S, Kofinas, G. P and Folke, C eds. (2009). Principles of Ecosystem Stewardship: Resilience-Based Natural Resource Management. New York, USA: Springer. Cinner, J. E, McClanahan, T. R, MacNeil, M. A, Graham, N. A. J, Daw, T. M, Mukminin, A, Feary, D. A, Rabearisoa, A. L, Wamukota, A, Jiddawi, N, Campbell, S. J, Baird, A. H, Januchowski-Hartley, F. A, Hamed, S, Lahari, R, Morove, T and Kuange, J (2012). Comanagement of Coral Reef Social-Ecological Systems. Proceedings of the National Academy of Sciences of the United States of America 109(14): 5219–22. http://dx.doi.org/10.1073/pnas.1121215109. Clement, F (2010). Analysing Decentralised Natural Resource Governance: Proposition for a “Politicised” Institutional Analysis and Development Framework. Policy Sciences 43(2): 129–156. http://dx.doi.org/10.1007/s11077-009-9100-8. Collins, S. L, Carpenter, S. R, Swinton, S. M, Orenstein, D. E, Childers, D. L, Gragson, T. L, Grimm, N. B, Grove, J. M, Harlan, S. L, Kaye, J. P, Knapp, A. K, Kofinas, G. P, Magnuson, J. J, McDowll, W. H, Melack, J. M, Ogden, L. A, Robertson, G. P, Smith, M. D and Whitmer, A. C (2011). An Integrated Conceptual Framework for Long-Term Social–Ecological Research. Frontiers in Ecology and the Environment 9(6): 351–357. http://dx.doi.org/10.1890/100068. Duer-Balkind, M, Jacobs, K. R and Basurto, X (2013). Resilience, Social-Ecological Rules, and Environmental Variability in a Two-Species Artisanal Fishery. Ecology and Society 18(4) http://dx.doi.org/10.5751/ES-05751-180450. Dustin Becker, C (1999). Protecting a Garúa forest in Ecuador: The Role of Institutions and Ecosystem Valuation. Ambio 28(2): 156–161. Epstein, G, Vogt, J. M, Mincey, S, Cox, M and Fischer, B (2013). Missing Ecology: Integrating Ecological Perspectives with the Social-Ecological System Framework. International Journal of the Commons 7(2): 432–453. http://dx.doi.org/10.18352/ijc.371. Farjon, A, Pérez de la Rosa, J and Styles, B. T (1997). Guía de campo de los pinos de México y América Central. Oxford, UK: The Royal Botanical Gardens, Kew. Flores-Díaz, A. C, Castillo, A, Sánchez-Matías, M and Maass, M (2014). Local Values and Decisions: Views and Constraints for Riparian Management in Western Mexico. Knowledge and Management of Aquatic Ecosystems 3(414): 06. http://dx.doi.org/10.1051/kmae/2014017. García-Frapolli, E, Toledo, V. M and Martinez-Alier, J (2008). Adaptations of a Yucatec Maya Multiple-Use Ecological Management Strategy to Ecotourism. Ecology and Society 13(2): 31. Gerritsen, P. R. W (2010). Perspectivas campesinas sobre el manejo de los recursos naturales. México, D.F. : Mundiprensa, Universidad de Guadalajara. Holling, C. S (1973). Resilience and Stability of Ecological Systems. Annual Review of Ecology and Systematics 4: 1–23. http://dx.doi.org/10.1146/annurev.es.04.110173.000245. Janssen, M. A and Ostrom, E (2006). Governing Social-Ecological Systems In: Handbook of Computational Economics. Tesfatsion, L and Judd, K. L eds. : 1466–1496. Vol. 2Amsterdam: Elsevier. Janssen, M. A, Anderies, J. M and Ostrom, E (2007). Robustness of Social-Ecological Systems to Spatial and Temporal Variability. Society & Natural Resources 20(4): 307–322. http://dx.doi.org/10.1080/08941920601161320. Kratz, T. K, Deegan, L. A, Harmon, M. E and Lauenroth, W. K (2003). Ecological Variability in Space and Time: Insights Gained from the US LTER Program. BioScience 53(1): 57. http://dx.doi.org/10.1641/0006-3568(2003)053[0057:EV-SAT]2.0.CO;2. Liu, J, Dietz, T, Carpenter, S and Alberti, M (2007). Complexity of Coupled Human and Natural Systems. Science 317(5844): 1513–1516. http://dx.doi.org/10.1126/science.1144004. Ludwig, D, Hilborn, R and Walters, C (1993). Uncertainty, Resource Exploitation, and Conservation: Lessons from History. Science 260: 17–36. http://dx.doi.org/10.1126/science.260.5104.17. Maass, J. M, Balvanera, P, Castillo, A, Daily, G. C, Mooney, H. A, Ehrlich, P, Quesada, M, Miranda, A, Jaramillo, V. J, García-Oliva, F, Martínez-Yrizar, A, Cotler, H, López-Blanco, J, Pérez-Jiménez, A, Búrquez, A, Tinoco, C, Ceballos, G, Barraza, L, Ayala, R and Sarukhán, J (2005). Ecosystem Services of Tropical Dry Forests: Insights from Long-Term Ecological and Social Research on the Pacific Coast of Mexico. Ecology and Society 10(1): 17. http://doi.org/17\nArtn 17. McGinnis, M. D (2011). Networks of Adjacent Action Situations in Polycentric Governance. Policy Studies Journal 39(1): 51–78. http://dx.doi.org/10.1111/j.1541-0072.2010.00396.x. McGinnis, M. D and Ostrom, E (2014). Social-Ecological System Framework: Initial Changes and Continuing Challenges. Ecology and Society 19(2): 30. http://dx.doi.org/10.5751/ES-06387-190230. McKean, M (2000). Common Property: What Is It, What Is It Good for, and What Makes it Work? In: People and Forests: Communities, Institutions, and Governance. : 27–55. Cambridge, Massachusetts: The MIT Press. Méndez-Toribio, M, Zermeño-Hernández, I and Ibarra-Manríquez, G (2014). 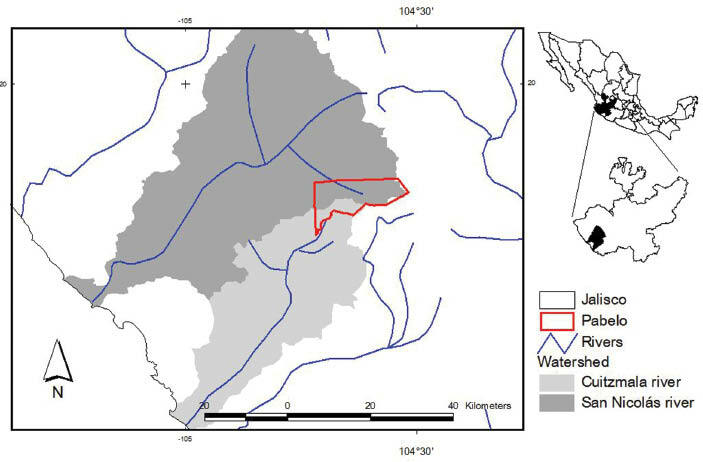 Effect of Land Use on the Structure and Diversity of Riparian Vegetation in the Duero River Watershed in Michoacán, Mexico. Plant Ecology 215(3): 285–296. http://dx.doi.org/10.1007/s11258-014-0297-z. Merino, L ed. (1997). El manejo forestal comunitario en México y sus perspectivas de sustentabilidad. México, D.F. : Universidad Nacional Autónoma de México. Merino, L (2004). Conservación o deterioro. El impacto de las políticas públicas en las instituciones comunitarias y en los usos de los bosques en México. México, D.F. : Secretaría de Medio Ambiente y Recursos Naturales. Instituto de Ecología. Consejo Civil Mexicano para la Silvicultura Sostenible A.C.
Merino, L and Martínez, A. E (2013). El campo forestal mexicano y las cominidades forestales In: Encuentros y desencuentros: las comunidades forestales y las políticas públicas en tiempos de transición. Merino, L and Ortiz, G eds. : 35–66. México, D.F. : Universidad Nacional Autónoma de México. Miguel Ángel Porrúa. Meyerson, F. A, Merino, L and Durand, J (2007). Migration and Environment in the Context of Globalization. Frontiers in Ecology and the Environment 5(4): 182–190. http://dx.doi.org/10.1890/1540-9295(2007)5[182:MAEITC]2.0.CO;2. Morales, J. G and Rodriguez, J. L (2012). Flora y vegetación de Villas de Cacoma en el municipio de Villa Purificación, Tesis de licenciatura. Universidad Nacional Autónoma de México. Naiman, R. J and Décamps, H (1997). The Ecology of Interfaces: Riparian Zones. Anual Review of Ecology and Systematics 28: 621–658. http://dx.doi.org/10.1146/annurev.ecolsys.28.1.621. Newing, H (2011). Conducting Research in Conservation: A Social Science Perspective. New York: Routledge. Ostrom, E (2005). Understanding the Diversity of Structured Human Interactions In: Understanding Institutional Diversity. : 3–31. Princeton University Press. Ostrom, E (2011a). Background on the Institutional Analysis and Development Framework. Policy Studies Journal 39(1): 7–28. http://dx.doi.org/10.1111/j.1541-0072.2010.00394.x. Ostrom, E (2011b). El gobierno de los bienes comunes: la evolución de las instituciones de acción colectiva. 2a edición México, D.F. : Fondo de Cultura Económica. Instituto de Investigaciones Sociales de la Universidad Nacional Autónoma de México. Porter-Bolland, L, Ellis, E. A, Guariguata, M. R, Ruiz-Mallén, I, Negrete-Yankelevich, S and Reyes-García, V (2012). Community Managed Forests and Forest Protected Areas: An Assessment of Their Conservation Effectiveness Across the Tropics. Forest Ecology and Management 268: 6–17. http://dx.doi.org/10.1016/j.foreco.2011.05.034. Poteete, A. R, Janssen, M. A and Ostrom, E (2012). Trabajar juntos: acción colectiva, bienes comunes y múltiples métodos en la práctica. México, D.F. : Fondo de Cultura Económica. Redman, C. L, Grove, J. M and Kuby, L. H (2004). Integrating Social Science into the Long-Term Ecological Research (LTER) Network: Social Dimensions of Ecological Change and Ecological Dimensions of Social Change. Ecosystems 7(2): 161–171. http://dx.doi.org/10.1007/s10021-003-0215-z. Regalado, A (2009). Poder en el trópico: mecanismos de poder en la costa sur de Jalisco. Guadalajara, México: Ayuntamiento Constitucional de Casimiro Castillo. Universidad de Guadalajara. Renfrew, C (2009). Introduction. Changing perspectives on the Emergence of Human Values In: Becoming Human: Innovation in Prehistoric Material and Spiritual Culture. Renfrew, C and Morley, I eds. : 1–9. Cambridge, UK: Cambridge University Press. Riensche, M, Castillo, A, Flores-Díaz, A and Maass, M (2015). Tourism at Costalegre, Mexico: An Ecosystem Services-Based Exploration of Current Challenges and Alternative Futures. Futures 66: 70–84. http://dx.doi.org/10.1016/j.futures.2014.12.012. Rzedowski, J and McVaugh, R (1966). La vegetación de Nueva Galicia. Michigan: Contributions from the University of Michigan Herbarium. Sánchez-Matías, M (2004). Percepción social y consumo de los servicios ecosistémicos derivados de la biodiversidad vegetal en la cuenca del río Cuitzmala, Jalisco. Tesis de Maestría. Morelia: Universidad Nacional Autónoma de México. Sarukhan, J, Urquiza-Haas, T, Koleff, P, Carabias, J, Dirzo, R, Ezcurra, E, Cerdeira-Estrada, S and Soberon, J (2014). Strategic Actions to Value, Conserve, and Restore the Natural Capital of Megadiversity Countries: The Case of Mexico. BioScience 65(2): 164–173. http://dx.doi.org/10.1093/biosci/biu195. Schroeder, N. M and Castillo, A (2012). Collective Action in the Management of a Tropical Dry Forest Ecosystem: Effects of Mexico's Property Rights Regime. Environmental Management 51(4): 850–61. http://dx.doi.org/10.1007/s00267-012-9980-9. Skutsch, M, Simon, C, Velazquez, A and Fernández, J. C (2013). Rights to carbon and payments for services rendered under REDD+: Options for the Case of Mexico. Global Environmental Change 23(4): 813–825. http://dx.doi.org/10.1016/j.gloenvcha.2013.02.015. Skutsch, M, Borrego, A, Morales-Barquero, L, Paneque-Gálvez, J, Salinas-Melgoza, M, Ramírez, M. I, Perez-Salicrup, D, Benet, D, Monroy, S and Gao, Y (2015). Opportunities, Constraints and Perceptions of Rural Communities Regarding Their Potential to Contribute to Forest Landscape Transitions Under REDD+: Case Studies from Mexico. International Forestry Review 17(SI): 65–84. http://dx.doi.org/10.1505/146554815814669025. Strauss, A. L (1995). Qualitative Analysis for Social Scientists. New York, USA: Cambridge University Press. Vázquez, J. A, Cuevas, R, Cochrane, T. S, Iltis, H. H, Santana, F. J and Guzmán, L (1995). Flora de Manantlán. Fort Worth: Universidad de Guadalajara, University of Wisconsin-Madison, Botanical Research Institute of Texas. Villaseñor, J. L and Ortiz, E (2014). Biodiversidad de las plantas con flores (División Magnoliophyta) en México. Revista Mexicana de Biodiversidad 85 (Suppl. ): 134–142. http://dx.doi.org/10.7550/rmb.31987.